National University of Singapore researchers have pioneered a new water-based air-conditioning system that cools air to as low as 18º C (64.4º F) without using energy-intensive compressors and environmentally harmful chemical refrigerants. This disruptive type of technology could potentially replace the century-old air-cooling principle that is still being used in our modern-day air-conditioners. Suitable for both indoor and outdoor use, the novel system is portable and it can also be customized for all types of weather conditions. NUS Engineering researchers developed a novel air cooling technology that could redefine the future of air-conditioning. Image Credit: National University of Singapore. Click image for the largest view. 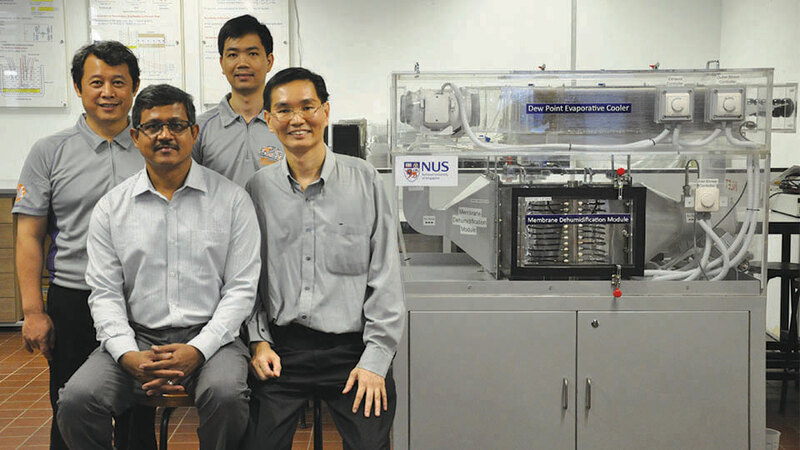 Led by Associate Professor Ernest Chua from the Department of Mechanical Engineering at NUS Faculty of Engineering, the team’s novel air-conditioning system is cost-effective to produce, and it is also more eco-friendly and sustainable. The system consumes about 40 percent less electricity than current compressor-based air-conditioners used in homes and commercial buildings. This translates into more than a 40 percent reduction in carbon emissions. In addition, it adopts a water-based cooling technology instead of using chemical refrigerants such as chlorofluorocarbon and hydrochlorofluorocarbon for cooling, thus making it safer and more environmentally-friendly. Adding another feather to its eco-friendliness cap, the novel system generates potable drinking water while it cools the ambient air. The novel air-conditioning system first uses an innovative membrane technology – a paper-like material – to remove moisture from humid outdoor air. The dehumidified air is then cooled via a dew-point cooling system that uses water as the cooling medium instead of harmful chemical refrigerants. Unlike vapor compression air-conditioners, the novel system does not release hot air to the environment. Instead, a cool air stream that is comparatively less humid than environmental humidity is discharged – negating the effect of micro-climate. About 12 to 15 liters of potable drinking water can also be harvested after operating the air-conditioning system for a day. The research team is currently refining the design of the air-conditioning system to further improve its user-friendliness. The NUS researchers are also working to incorporate smart features such as pre-programmed thermal settings based on human occupancy and real-time tracking of its energy efficiency. The team hopes to work with industry partners to commercialize the technology. Looks and sounds good. But that discharge temperature looks barely adequate for the developed world’s jaded consumers. Drying the air will make huge difference, cooling the circulating air far enough to condense out the water vapor is a big part of the A/C energy cost. So it looks like a sure half way, first step, kind of thing. The approach is also a sophisticated look at A/C as its done now. Going to two steps with such impressive results is sure to cause an engineering rethink for current designs marketed in the developed world now. Is it a revolution or disruptive technology? Almost. Where new installations with capital cost decisions are tight and running expense is a concern, this technology should find a warm reception. Energy savings alone could justify both if reliable. This novel technology is also highly suitable for confined spaces such as bomb shelters or bunkers, where removing moisture from the air is critical for human comfort, as well as for sustainable operation of delicate equipment in areas such as field hospitals, armored personnel carriers, and operation decks of navy ships as well as aircraft. The research team is currently refining the design of the air-conditioning system to further improve its user-friendliness. The approach is also a sophisticated look at A/C as its done now. I am very interested in this technology, I live in Phoenix Arizona and I could see your technology being tested here. I would love to get involved with the marketing and sales of this new tech, I can help! That’s great create design. It will human protect environment. I am involved in solar hybrid air conditioning,can you update me whenever the technology/product is commercially ready.